I’d set my alarm so that I could get up early this morning and beat the crowds at the weekly market in Gignac, but rain on the roof around dawn woke me before the alarm. I burrowed under the covers, listened to the rain and wondered if I really needed anything at the market anyway. For the past month, first with Marilla and then Barbara, the Saturday market has been a source of entertainment; the cheeses, the olives, the mounds of bright vegetables. We bought hugely and ate hugely. This week I only needed to shop for myself–not quite as much fun and something that could be accomplished at the less colorful but well stocked intermarché. I went to the Gignac market anyway. Rain had kept the crowds away, the usually full outdoor cafés were empty and some of the stalls were already closing. Live chickens huddled together in their crates looked damp and miserable — although what a happy chicken looks like I couldn’t say. Since I’d left without breakfast, I bought a Roquefort tart from the boulangerie, ordered a café creme at the place next door and found a covered spot. Sitting there, eavesdropping on French conversations, actually understanding a bit here and there, I felt very content, very much at home somehow. Only six months in France yet it feels so much longer. I thought of the first time I went to the Thursday market in Exideuill. Newly arrived, I was beside myself with excitement. I took notes, snapped pictures (see above) and was so busy absorbing the theatre of it all that I couldn’t even think about buying food. Today, I bought half a dozen or so of the scalloped and bright red tomates ancienne, then misplaced my umbrella –the Dali one I’d bought in Spain– and spent the next 30 minutes tracking it down. “Excusez moi, je cherchez ma parapleui.” I found it. Now, as I write this, it is still pouring but the apartment is cozy with lamps and candles and music playing and I’m enjoying that content and rooted feeling. Still, I go back and forth about what I want to do. One minute, I can imagine staying in France indefinitely, the next, I’m overcome with longing to see my family, to hear familiar voices. If I stay, I know I want to find a place with a terrace or garden–some sort of outdoor area. I’d also like to be closer to a larger town–although if I get a car (and my French teacher’s husband and a neighbor are looking for me) Montpellier is an easy drive. I’m told I can easily sell the car when I decide to leave. There is also much about Montpeyroux that appeals to me. The friendliness of neighbors–an elderly woman opposite who told me not to wait for an engraved invitation but to come over any time. She would, she said, teach me French and how to cook like a French woman. That offer seems almost irresistible. Although I regret that I gave the vendange short shrift (maybe next year. . . and my French will be better!) I am fascinated by the wine making process and its impact on the villages. I’m in the middle of reading The Ripening Sun by Patricia Atkinson. 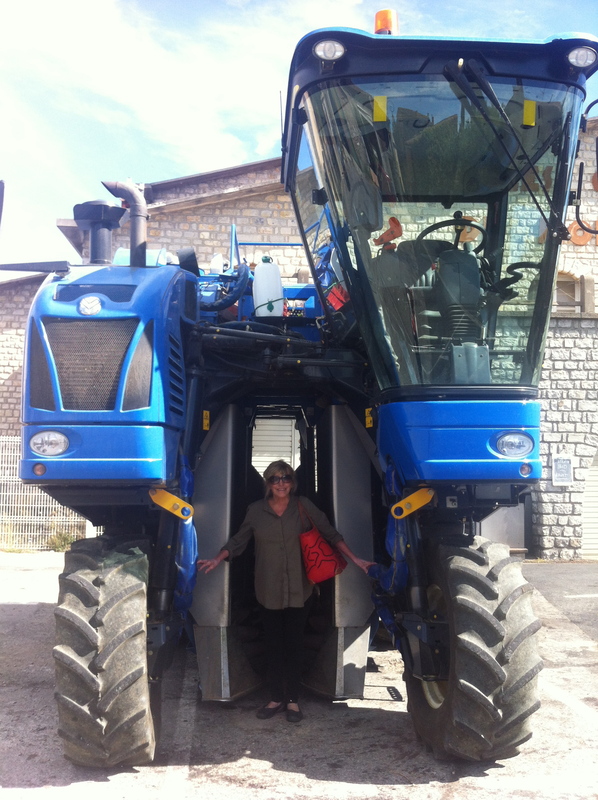 With seemingly wide-eyed naivete and no knowledge of French, even more naive, she succumbed to the dream of becoming a wine maker in southwest France. To describe the work as formidable is an understatement; reading a few chapters every night, I’m exhausted myself. If her account didn’t discourage others with similar notions, I don’t think anything would. Fortunately for wine drinkers though, the rewards of being a vintner are apparently sufficient to keep the wine flowing. As an observer, I love the prospect of experiencing the different seasons in the vineyards. I’ve now seen spring, summer and early autumn. An English neighbor, whose French husband is a winemaker for the cooperative of a nearby village, has worked the vendange for years. 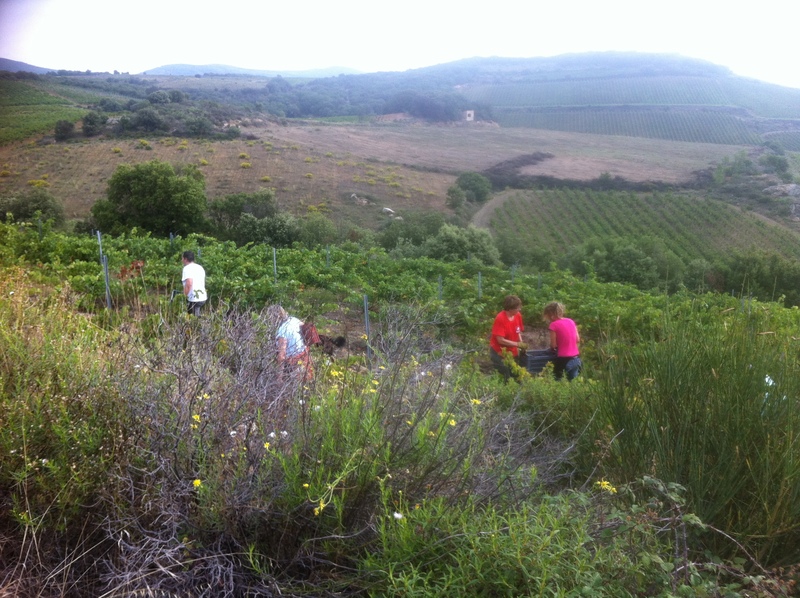 The tidying up of the vineyards, as she called it, is the next step. Leaves, already brown and drying, will be burned. The long trailing vines cut and bundled, some will also be burned. November, as everything slows to winter, is her favorite time she says. The whisps of smoke from bonfires in the morning air. The clear light. All very peaceful and beautiful. So I think of moving on, then find that the more I learn about where I am, the more I want to know. But perhaps that’s the way of life. Beautiful autumn days here in the south of France. Walked through the vineyards this morning. Olive trees around the village are full of pale green fruit. Very hard to the touch at the moment, but I have no idea what olives look like when they’re ready to harvest. A few seem to be changing color. New sounds in the vineyards for the past few days; the pop of hunters’ guns. Pheasant? Quail? No idea. Trying to turn the truck around on a dirt road last week, I scared a few out of the shrubs and they strutted across the road in front of my wheels. The gun shots make me a bit leery–reminiscent of searching for chanterelles in the Pacific Northwest at the start of the hunting season. Walking back into the village, a more melodic sound–piano scales from an open window drifting down to the street. The dog ate my post . . .
Or why it’s been a couple of weeks since I last wrote. Reason #1. Marilla and I have spent the better part of two days on busses and trams and a navette (shuttle) or two. Put another way, we’ve learned a great deal about public transportation in and around Montpellier in order to gain access to private transportation. More about that in a bit. Reason #2. Some things are more fun than writing. No! While I really haven’t felt lonely or — except briefly– homesick since I arrived in France, almost six months ago now, it’s been wonderful having company. The joys of yakking over coffee in the morning, exploring the area during the day, then more yakking over wine at night have provided stiff competition to time spent working at the computer. Actually, most things provide stiff competition to working at the computer. Since I’m still essentially a tourist myself, I don’t need much persuasion to leave my desk. 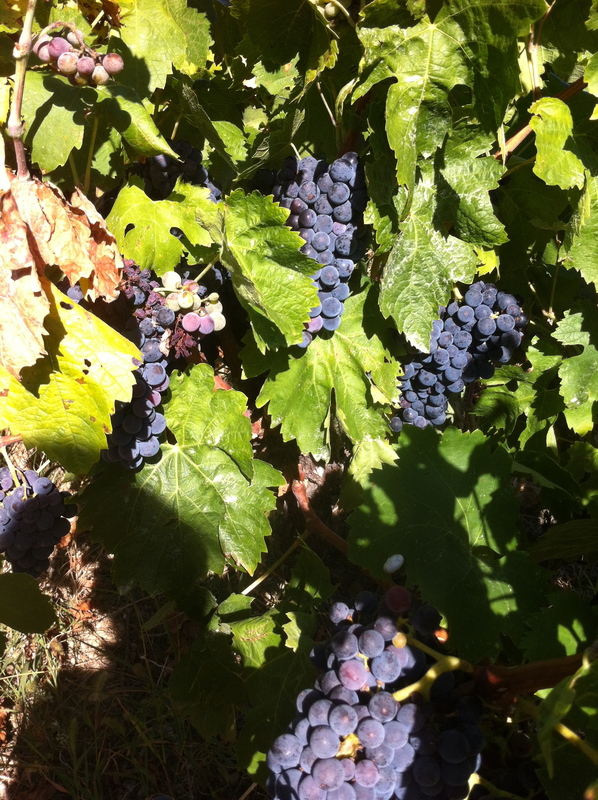 We’ve taken walks through the vineyards, last week still full of purple blue bunches of grapes. I picked bouquets of thyme, rosemary and lavender for my own herbes de provence mixture. We found fig trees dropping their juicy little gifts at our feet– some we helped along by shaking the branches. Ripe figs are delicious fresh, incredible broiled with blue cheese. One day, we walked through the vineyards to Arboras, a village just up the hill, and ate salads of chevre drizzled with honey. A glass or two or rosé is, of course, obligatory. We’ve also done the sort of thing that has now become part of my life in France–the Saturday market in Gignac for cheese, olives and, from a nearby boulangerie, an olive studded baguette that is only available on market days. At the Sunday puce–flea market–in Paulhan I bartered, in French, for a couple of wicker chairs. We both admired a little egg basket that folds flat. Although I bought it for myself, I should really give it to Marilla to take back to the States as a souvenir. Jury is still out on that. I’ve also succeeded in infecting Marilla with my obsession for witnessing the vendange. Or she’s just being polite. 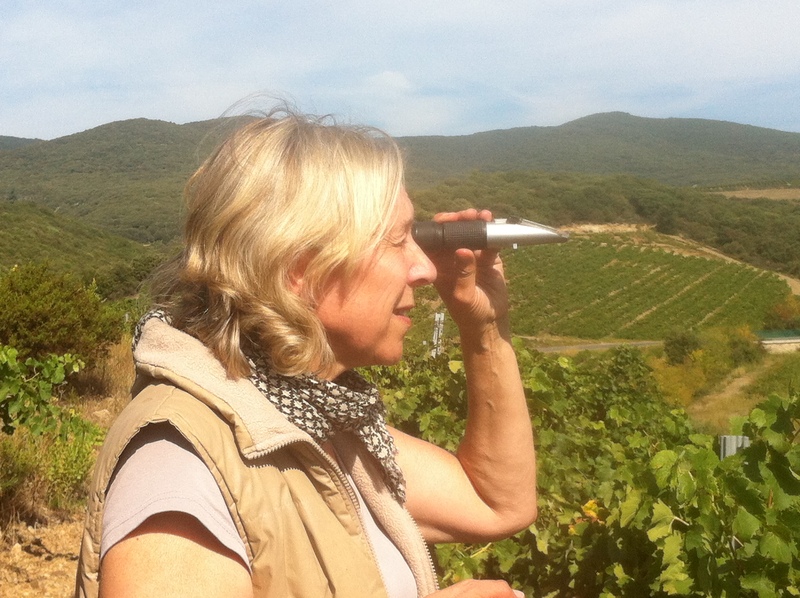 Anyway, we’ve been zealously watching the vineyards; as of yesterday, still lots of grapes unharvested. I’ve set the alarm and we’ve wandered out in the pre-dawn light hoping to see grape pickers. Instead we caught a dramatic early morning sunrise, a lot of activity around the Montpeyroux cooperative involving tractors of every size, shape and color and bins full of picked grapes. We’ve also watched mechanical pickers in the fields, but we’re holding out for bent backs and human toiling. If all else fails, I’ll have Marilla do some toiling, I’m sure she’d be happy to oblige. A few days ago, we decided to rent a car so that we could explore further afield. The cheapest rentals were at the airport — maybe an hour from Montpeyroux by car, considerably longer when things don’t go quite as planned. If, as the saying goes, getting there is half the fun, the last couple of days had to rank high on the list of ways to entertain visitors — future and prospective visitors should confirm that with Marilla though . . .
Day 1 of the rent-a-car adventure, we walked around to the cooperative to catch the 12:35 bus to Montpellier. It rolled into view about 12:48, we boarded and paid our 1.60 euro fare. Although the destination on the front of the bus said Montpellier, I was pretty sure we changed busses in Gignac and confirmed this by mumbling something to the driver which he didn’t understand. Then he mumbled back something that I didn’t understand. Employing the sheep theory, which I do a lot in France, when everyone else got off the bus in Gignac, we did too. Good decision. The bus to Montpellier was waiting. At the Mosson tram station in Montpellier we bought tickets and got on the tram to Place de l’Europe. According to the schedule I’d found on line (much easier to do it this way, I’m discovering, than battle with the language later) this was where we’d catch the airport shuttle. Somehow though we failed to notice the bus stop across the road and wandered around Place de l’Europe looking for anything resembling a shuttle stop. Eventually, I asked a bus driver. At first– usually the case when I go into my fractured French explanations– I got the blank, uncomprehending stare. Then I fractured a bit more French and, voila, he understood. I get such a charge when that happens. By the time we got to the shuttle stop it was nearly three p.m., almost an hour after the time we were supposed to pick up the car. I call the rental company and explain that we’re running late. No problem, I’m told. At four, we walk into the rental office and I hand them my reservation information. The clerk behind the counter shrugs. There is no record of a car reserved in my name. Nothing. Rien. The reservation has disappeared. Perhaps a dog ate it. My card had not been charged though and she could offer us a car for approximately three times the cost of what we’d originally been quoted. Marilla and I stared at one another. Our options–to pay an exorbitant sum, or to head back to Montpeyroux. By this time it was nearly five p.m. and the last bus back to the village was . . . leaving very shortly and we still had to catch a navette, another tram and a connecting bus. We chose to race the clock. At one point, when the tram back to Mosson stalled, it felt a bit like an episode of the Amazing Race. It was after seven by the time we were back in the apartment toasting our adventure, albeit unsuccessful, with a glass of wine. The next day, we took the bus back into Montpellier and picked up a car from the Gare St Roch station–decent price and easier than going out to the airport again. “But we learned a lot,” I said to Marilla. “Yes, we did,” she agreed. “But it was fun though, wasn’t it?” I asked. I think she had fun. Tomorrow, we’re off on a new adventure. Did I miss the vendange? Vendange? My definition. A supermarket wine sold in large bottles that I sometimes drank at home, but, snob that I am, wouldn’t take to a dinner party if I wanted to impress. But that was BF–Before France. I don’t mean that France has cured me of wine snobbery; I’m talking words. Vendange –along with transhumance (the seasonal movement of livestock) and vide grenier (attic clearance, think big garage sale)– has been given a place in my French adventure lexicon. At least, I hope to include vendange. The adventure hasn’t quite happened yet. 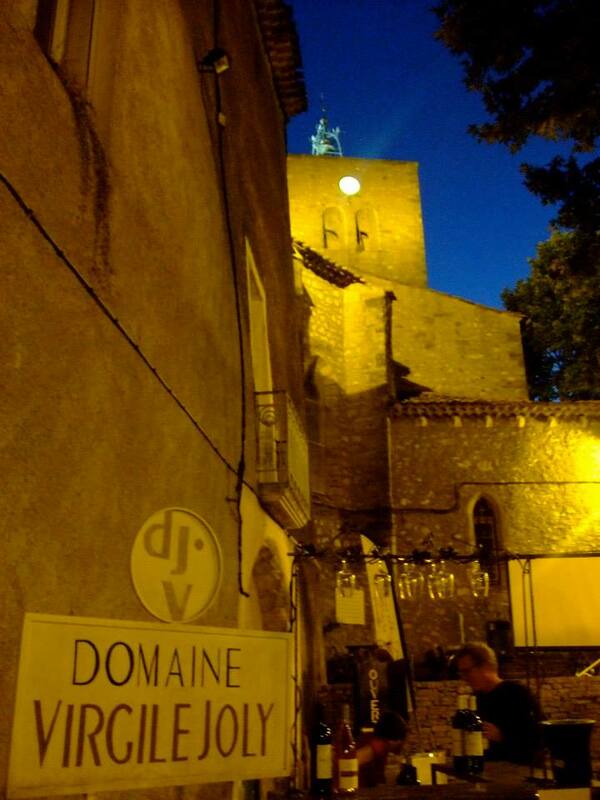 Montpeyroux, like most of its neighbors in the Herault department of Languedoc-Roussillon, is a wine village. If the vineyards all around don’t tip you off, the wine makers’ advertising, like campaign posters at election time, will. 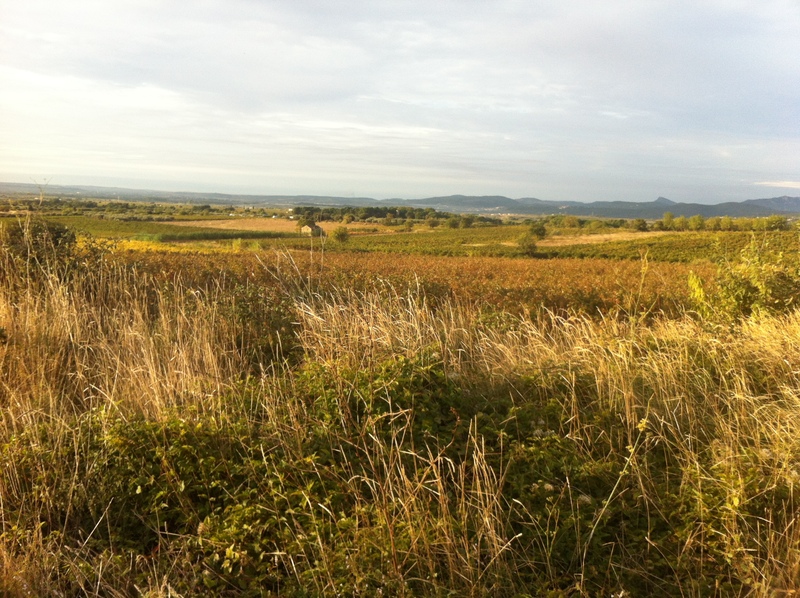 The region has some 740,000 acres of vineyards — about three times the combined area of Bordeaux vineyards. I’ve been hearing and reading about the vendange–or, more accurately, the anticipated vendange for weeks. Because of a cool spring, harvesting is very late this year. I read that 2013 might turn out to be the latest vendange since the 1930’s. Eventually the day will come though. The time,so to speak, will be ripe. Seasonal workers will descend on the village where they’ll be trucked out to toil in the vineyards. Crouched low to the ground, they’ll move down the rows of vines, clip off the grape clusters and drop them into buckets. When full, the buckets will be emptied into barrels and taken away for processing. After a day of hard work there will be music and drinking, (non!) community meals and lots of merriment. It sounds like fun and I don’t want to miss it (the merriment, less so the toiling) but I keep worrying that I will. Actually, I also worried about missing the transhumance which involved several hundred sheep making their way past my front door– with bells around their necks. I tend to worry over things about which I have very little control. Not only did I not miss the transhumance, evidence of it stuck around, literally, for several days. But while the transhumance and vide grenier were events I could mark on my calendar (although the vide grenier was almost cancelled due to rain) timing of the vendange is a little trickier. Alarms will not sound, church bells won’t toll to send the pickers on their merry ways, a collective cheer won’t ring through the village–although perhaps it might when the work is all over. The thing is, no-one can really be sure of exactly the right moment to begin the harvest. Art versus science, or perhaps art and science. Grapes are tested daily for sugar content, tannins, the ripeness of skins and a host of other subtleties that will make the difference between a good bottle and . . . Vendange? Winemakers hope for a few more sunny days and the weather has been obliging so far, but there are storms forecast for the weekend which no-one is happy about. Rain and hail earlier this year wreaked havoc on Bordeaux area vineyards. In France, not much happens in the middle of the day. Accordingly, grape picking is done early in the morning, while the weather is still comfortably cool. This led me to worry that the grapes might have been picked while I slept and that I had managed to miss the whole thing. I took a walk out to the vineyards. Although tractors often rumble down my road, there were none in the fields. Actually, there was no-one in the fields except me–it was, after all, 2 p.m. At first glance, I couldn’t see grapes on the vines either. And then I did. Big, purple blue clusters hanging like Xmas ornaments. Mourvédre,Carignan, Syrah, Grenache and Cinsault. I’d like to leave the impression that I recognized them, but I just looked up names of grapes grown in this area. They all looked like purple blue grapes to me. Picturesque though. I tasted a few. Smaller than table grapes, firm and intensely sweet. I would have tasted some white ones too, but I couldn’t find any. Perhaps they’ve been picked, now that I think of it. I did hear that the whites are picked first. So everyone’s playing the waiting game. I confided my fear of missing the vendange to a friend who is letting workers pitch tents on her property. She laughed and assured me I wouldn’t miss it. It takes a while, a couple of weeks maybe, to harvest all those grapes. I told her I might try my hand at picking some myself. She didn’t exactly laugh at that, but warned that it’s hard on the back. I meant to ask whether grape stomping is one of those things that they only do in movies. If not, it might be something I’d be good at. Or tasting, I’d enjoy that. Just to be sure I don’t sleep through anything, I’m planning to set my alarm for the rest of the week. Below: Grapes . . . of some kind. 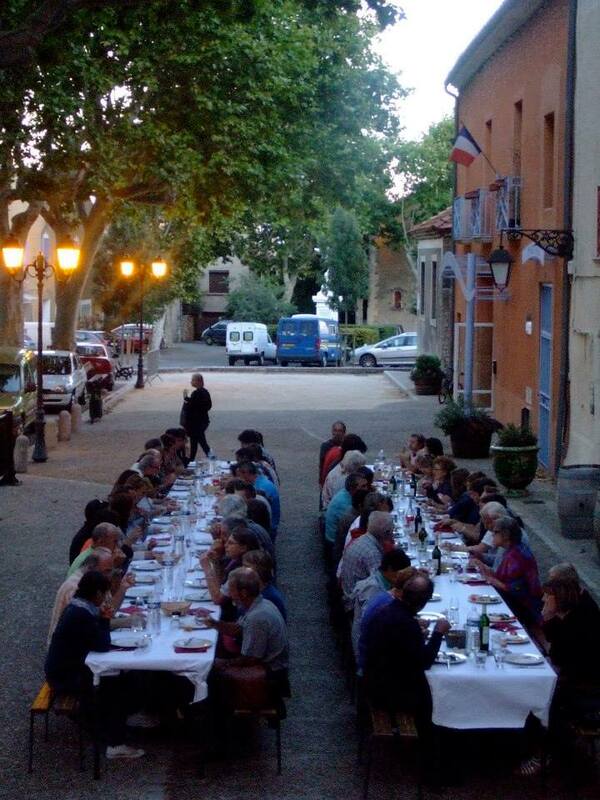 Pictures from a winemaker’s dinner I attended at Domaine Virgil Joly in nearby San Saturnin. Thanks to Louise Hurren for the invite. postscript. After I posted, I saw this on Facebook from a local winegrower.